Bloggers hangout presents a simple way to add advertisement space to Blogger sidebar. 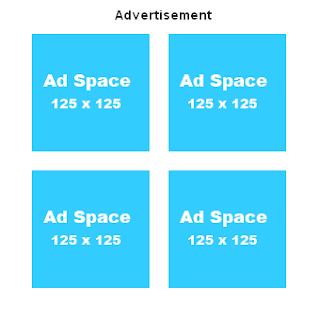 It consist of four Ad space blocks and each Ad space block is of 125px x 125px. Step 1: Sign into your Blogger account and select the blog from the dashboard for which you want to add advertisement space to sidebar. Step 4: Go to Design>Page Elements and click Advertisements gadget. Copy the code which is given below and paste the code in content of Advertisement gadget. That's it! You successfully completed adding advertisement space to blogger sidebar. If you have any doubts about "How to add advertisement space to blogger sidebar", please don't hesitate to comment.